How to roast pumpkin seeds video with complete step by step instructions on how to bake pumpkin seeds or pepitas. Hi! 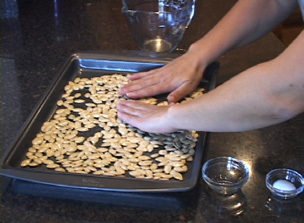 This is Laurie from RecipeTips.com, and today, I am going to show you how to roast pumpkin seeds. Once you have cleaned out the inside of your pumpkin, go through and separate the seeds from the pulp of the pumpkin. Make sure to rinse them under cold running water and then allow them to drain. Once you have rinsed the seeds, drained them, and patted them dry, add one tablespoon of vegetable oil per one cup of seeds. Make sure that they are all coated really well, and then pour them out onto an ungreased cookie sheet. Spread them out into a single layer, and then you are just going to add one teaspoon of salt per cup of seeds, but you can put as much salt on as you would like. Place the seeds in a 300 degree preheated oven for approximately 45 to 55 minutes, making sure to shake them every 10 minutes to prevent them from burning. Once the seeds are golden brown, remove them from the oven and allow them to cool, and they are ready to enjoy. For more great pumpkin recipes, visit RecipeTips.com.